Liverpool visited League Two side Exeter City in the third round of the FA Cup and like Liverpool players’ hamstrings these days, the accommodations were tight. So tight, in fact, that Jurgen Klopp had to give his pre-match interview in the tea room, giving us the delightful image above. At the end of the discussion on his side’s injury problems and rag-tag starting XI (look at these squad numbers! 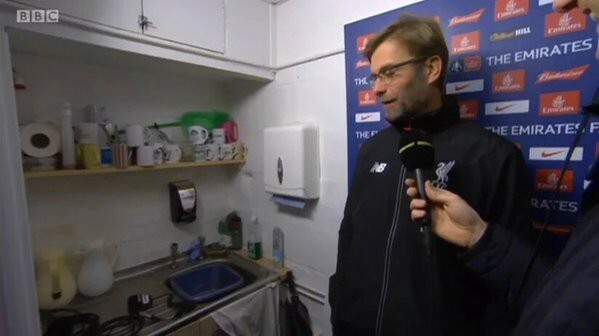 ), Klopp lamented the fact that there was no cup with his name on it. Despite this setback, the Exeter tea ladies were still able to accommodate him. To further illustrate the coziness of Exeter’s 8,541-capacity St. James Park, here are the doors to the home and away dressing rooms, which are so close together that they might lead to the same room. And then there were these guys watching from the window of a neighboring house. The magic of the FA Cup indeed. 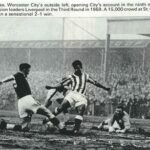 The match ended in a 2–2 draw with Exeter scoring an olimpico just before halftime. This forces a replay at Anfield, which is exactly what Liverpool players’ hamstrings don’t need.